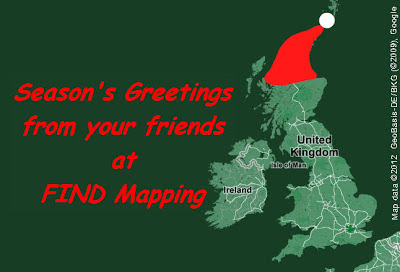 We thought we would take the opportunity to celebrate the festive season by producing a sketchmap. The above example uses a unique map background created with the 'Customise Map' feature. Usually the Google Map comes in its classic map legend, making the different map features like roads and parks easily recognisable. By changing some of the colours, the map background can be made to look more Christmas themed. In this case using a combination of greens. Red text was also added using the extensive range of annotation tools. To try your own hand at annotating a map just go to sketchmap.co.uk and click on the drawing tools to get started. 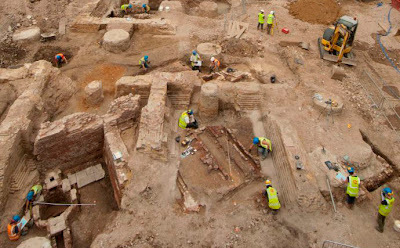 HeritageRisk.co.uk is an innovative online service designed specifically for archaeology and heritage risk assessment at the pre-planning stage. Chris There are a number of excellent testimonials on the FIND website, not just from developers, but from a whole range of organisations. Simon Absolutely Chris…I very much see relationships as being central to FIND’s success. We’re a small company specialising in data and technology. We work closely with data providers such as Ordnance Survey, English Heritage and so on…then add value to the data we deliver. One of the ways we can do that is to work in partnership with organisations like MOLA to deliver ‘Data +’. Chris So you’re providing data and its people like us who’re providing the interpretation of that data. Simon Exactly…and we’re expanding in several other areas by collaborating with partners who can add that level of expertise. For example, we’re currently working with a company that specialises in unexploded ordnance in order to deliver online UXO risk reports. Chris So what made you think that heritage risk was a good area to get into? Simon FIND already delivers a lot of heritage data. In fact our free site [sketchmap.co.uk] gives people access to data on listed buildings, scheduled monuments, battlefields and so on. Casual users are often interested in this sort of information, but to a developer it’s absolutely essential. It’s going to come out at some point in the planning process, so best to know in advance. Chris It’s interesting that you mention listed buildings, because we spend much more of our time now looking at above ground heritage. And the structures we’re looking at aren’t necessarily designated as the greatest buildings. It’s more a case of people’s perceptions. And as the general public has greater input into planning decisions, overall perception of the built environment is increasingly likely to become a risk for developers. And you can’t manage risks if you don’t understand them. Simon Exactly…I was always told that a good project is one where there are no surprises. Chris At MOLA we try to make sure that developers are informed and prepared. Having all the information you need in advance is far better than a scenario in which workers on site are standing idle and costs are mounting if a heritage or archaeological issues have suddenly arisen. Simon And providing this service online speeds up the process of getting crucial information about a site, understanding any issues and planning for them. Chris And do you think the online ordering system is straightforward? Simon Undoubtedly…everyone is now so familiar with ordering goods and services online that the days of doing this kind of work offline are fading fast. Ordering is very straightforward. Users just type in a postcode, view the area, mark up the site and then request a quick report, a detailed report or a full Historic Environment Assessment. Chris What impresses you most about MOLA assessments? Simon Not only do the reports look great, they’re easy to read and packed with information. Before embarking on projects like this we seek out the best partners. And when it comes to archaeological assessment, building assessment and heritage in general, there’s no better name than MOLA.